The Port of Hood River Commission has approved a parking management plan for Port-owned portions of the Hood River waterfront to be implemented early in summer 2018. Provide new resources for the ongoing maintenance, operation, and upgrades to Port-owned waterfront parks and open spaces. Beginning April 1, summer rates of $1.75 per hour will go into effect at the parking pay kiosks installed in convenient locations on the east and west blocks of Portway Avenue, both sides of N. 1st Street, the westernmost half of the Jensen Beach west parking lot. Payment can be made with debit or credit card at the kiosks. Coin or cash payment will not be accepted. A free download of the GIS supported Way to Park app enables users to avoid going to the kiosks altogether. Payment for parking can be made on the app using with a debit or credit card. The Way to Park app can be set up to send alerts to your phone to remind you when your parking time is about to run out and can provide the option to add time from your phone – no need to run back to the meter to add time. Pay by plate is a convenient way to register your payment for parking without making extra trips to your car to display a sticker in your window. Simply enter your license plate number into the kiosk or the Way to Park app when prompted. Enforcement will be done by an officer scanning your plate number to check for payment. Season passes for the Event Site and Jensen Beach parking lots are available for sale online at portofhoodriver.com until May 23 at preseason discount prices, good through December 31, 2019. These passes are also valid in the dirt lot portion of Zone 3 (“Lot 1”) whenever it is open for Event Site overflow parking. Season passes are transferable, but not refundable or replaceable. Beginning May 24, regular prices go into effect – $100 for vehicles up to 22 feet and $200 for overlength. Daily passes will be sold at the Event Site booth beginning May 24 for $8 for regular length vehicles and $15 for overlength. Passes are not valid for on-street parking. Purchase pre-season discount passes here. 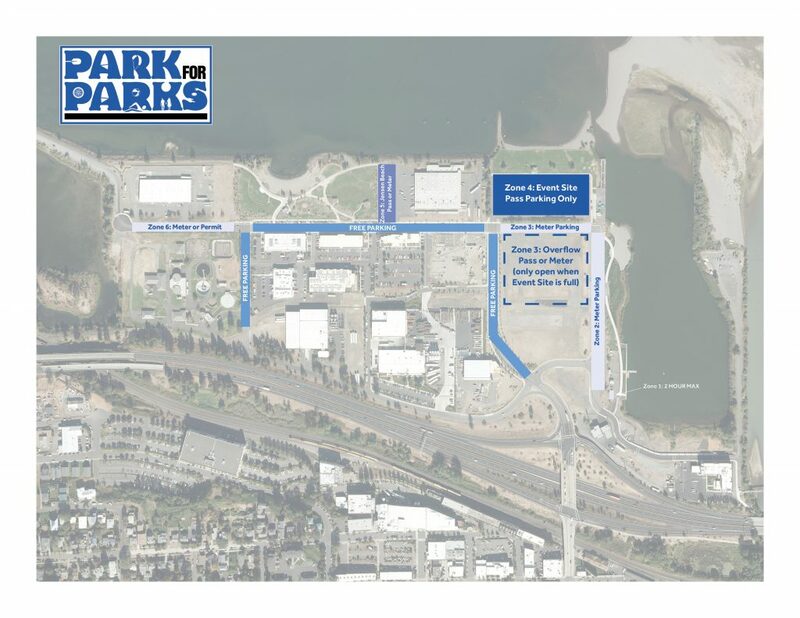 The parking rate schedule is meant to encourage turnover at the high demand parking areas of the Hood River waterfront and to support the cost of the ongoing maintenance of Port-owned parks and open spaces. The table below provides rates and maximum stay times for each parking zone. Paid parking or display of valid pass required from 9:00 a.m. to 8:00 p.m. all days including holidays. Overnight parking or camping is not allowed. Parking between the hours of 11:00 p.m. and 6:00 a.m. is prohibited in pay to park areas. Commercial trucks may purchase overnight or monthly passes. By entering and allowing your vehicle to remain in this Pay to Park Zone (“Zone”), a vehicle’s registered owner and/or operator (“You”) agree to enter into a contract with the Port of Hood River (“POHR”). If You do not accept the following terms and conditions, immediately remove your vehicle from the Zone to avoid POHR enforcement/collection actions. a. Pre-pay charges for each parking space used as posted on POHR parking kiosks and on the POHR website, www.portofhoodriver.com (“Website”), incorporated herein by reference. b. Not park longer than the maximum allowed time. c. Only park your vehicle in a space in the Zone where you paid to park. Payment only allows parking in that Zone. d. Obey all POHR official signs and regulations. a. Pay unpaid parking charges and late payment charges as posted on POHR parking kiosks and at the Website when due, and unpaid charges and late payment charges being sent to collections. b. Notices of parking complaints and warnings being affixed to your vehicle windshield or sent to you by mail. c. Indemnify the POHR against any loss or damage arising out of your negligence or breach of these terms and conditions. d. Resolve any dispute related to this agreement through the POHR internal resolution process, initiated by filing a POHR Dispute Form available at the POHR website or office. Only after filing a POHR Dispute Form and exhausting the POHR internal dispute resolution process may you seek redress in court. You agree to venue in Hood River County, Oregon. 3. POHR is not responsible for any injury, loss or damage to You or your vehicle or its contents. You will hold POHR harmless for any damage to your vehicle other than that caused by the negligence of POHR. 4. If any provision of this agreement is found to be unenforceable, the validity and enforceability of the remaining provisions will not be impaired.